Thought Garage: iPod : What happened between 2001 and 2005 and particularly around 2005 ? iPod : What happened between 2001 and 2005 and particularly around 2005 ? 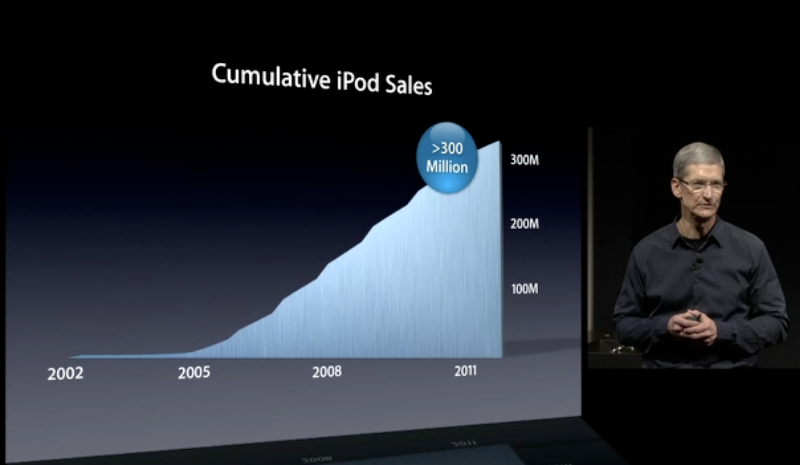 In today's Apple Special event, the CEO showed a nice graph of iPod cumulative sales and mentioned that Apple sold more than 300 Million units. It is an amazing number in itself. But what caught my eye is the graph showing the cumulative growth itself. Wondering why it took so long, until 2005 to gain momentum. And what was that pivotal moment in 2005 that changed the whole scene for iPods. If you remember, the iPod was introduced in 2001 and iTunes was introduced in 2003. But if you look at the graph, it took off around 2005, almost 4 years later after it was first introduced. What happened? What was that some thing amazing happened around 2005 that turned the tide in favor of iPods ? And here is another important question, why 'cumulative' graph was included in the presentation instead of year on year growth? It's much easier to guess that, I think. If not so obvious, check the following more detailed graph from Wikipedia. Of course, iPhone is eating into the iPod business. Numbers for iPods are expected to go slowly south. But that's not the point. Or is it ?